The Verwood Business meeting last night (10 October) at Costa Coffee generated great interest when the Mayor of Verwood, Cllr Peter Richardson gave a talk about his role. 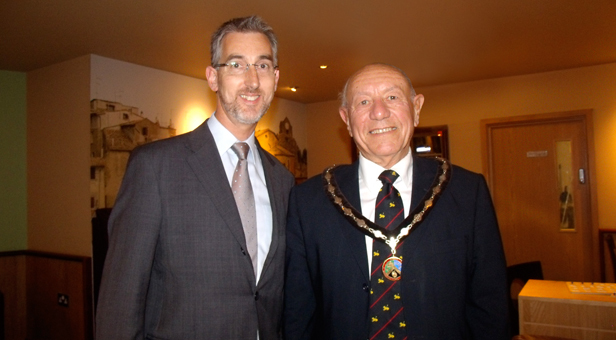 The 23rd mayor of the town moved to Verwood in 1972 and has been a town councillor for nine years. His wife and mayoress, Rosemary, is also a councillor and since Peter’s election on 20 May, he said they have attended 44 civic days. His responsibilities are to represent the town at civic functions, visit clubs, schools and organisations. He comes from a long line of dignitaries with his great, great, grandfather being the Mayor of Norwich during the 1830s and 40s. With several charities close to his heart, he has chosen to support three during his term of office: Verwood Stroke Club, Action on Hearing Loss (RNID) and Wessex Assisting Dogs. His talk was well-received by Verwood Business members and he informed them of his next fundrasing event – a charity auction on 19 October at Verwood Sports and Social Club, 7.30pm. Tickets £7.50 (couple £12). Over 70 lots. For more details call 01202 820880.